Music makes the world go round. But the world going around can also make music, as can the complex physics that underlies everything that happens in the Universe. Domenico Vicinanza and Genevieve Williams, a pair of from Anglia Ruskin University have teamed up to create a performance called "Jamming With The Universe" that'll see data from the Large Hadron Collider turned into music. Vicinanza, director of sound and game engineering research at the university, and Williams, co-director of the Cambridge Centre for Sport and Exercise Science, have sonified the LHC data - meaning that they've converted the peaks and troughs of the information into high and low notes. 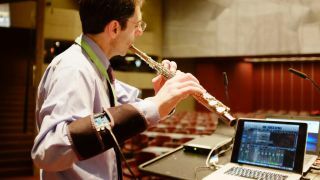 To control the musical phrases, they wear motion sensors that capture their movements. They'll be performing their piece at WOMAD Festival today, at Charlton Park in Wiltshire. Alongside the LHC data, the show will also include music generated from cosmic rays hitting detector pads on the stage, and live jazz piano improvisation from pianist Al Blatter. They also performed the piece at the recent Blue Dot festival. Williams told Techradar: "Structure and regularity is fundamental to the natural world, but variability plays its part too. Structure helps us make sense of what we observe around us, and create models and predictions, while variability is key to any live and real phenomena." She added: "No two snowflakes, heart beats, sunsets or rain drops are alike, there is always something different in everything natural. It is exactly because of this mix of structure and variability, predictable and unexpected, then that our music is both melodic and fascinating. "The audience can close their eyes and experience science with their ears."